Elias Lammam studied music composition and voice at the National Music Conservatory of Lebanon. As a composer for Dubai TV in the 1980's, he composed many scores for Middle Eastern television dramas, cartoons, and variety shows. He also composed music for commercials for Western companies including Coca-Cola, Gillette, and Lipton Tea for airing in the Middle East. 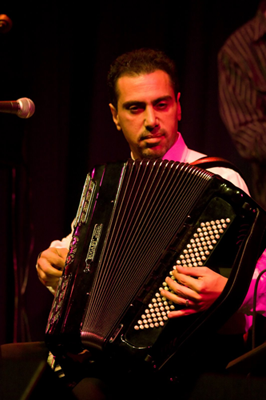 His compositions and accordion tracks can be heard on numerous CDs in the U.S., including those of The Georges Lammam Ensemble and L.A.-based singer Nader Muabdthalek, as well as on his own 1999 CD "Selsebil". His accordion music also can be heard on recordings with Rageb Aleme and other popular Arab singers. Mr. Lammam's accordion recordings were featured prominently in the score of the award-winning 2009 film "Amreeka". His accordion music was also used in the score of a recent Canadian documentary film produced by the Breast Cancer Foundation for broadcasting in the Gulf countries. Mr. Lammam provides original compositions, arrangements for ensembles of any size or type, studio recordings, and/or performances by contract for music, film, and television productions and live theatrical or orchestral performances. For more information about compositions or studio recordings, please contact Mr. Lammam at 424-270-3636.